Having established himself as an elite defender, O.G. 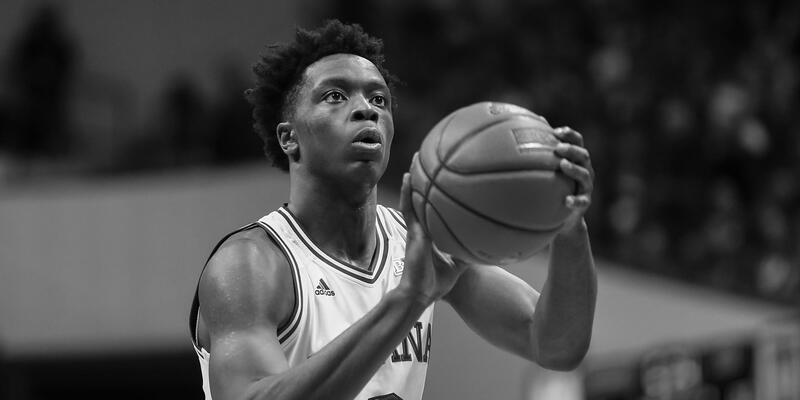 Anunoby is one of the NBA 2017 draft players to watch. Now about to transition from college to pro basketball, the 6’8” Indiana native is ready to take on new challenges. Here, the 19-year-old opens up about the draft, his game, and the what’s to come. Was it an easy decision to enter the draft and leave college early? The decision for me was certainly a difficult one. My family and I talked about if I was ready to transition to the NBA or if I wanted to stay at IU for another year. The coaches, students, and fans at Indiana were always so supportive of me, especially after I tore my ACL last year, so it made it that much harder to leave. But, I had a good idea heading into my sophomore season that I was going to declare when the season was over. I’ll definitely miss Bloomington next year, but I felt like this was the right time in my career. What is it like being in the draft? It’s been unreal. It’s almost hard to put into words. Playing in the NBA has been a dream of mine since I was a little kid. I’ve been working toward this goal for years, and being this close to achieving it is thrilling. I’m just trying to take it all in. What excites you most about transitioning from college to the NBA? Being able to focus on basketball 100 percent and getting to play against that next level of competition. I saw it in college too, coming out of high school: The players were so much stronger and the speed of the game was so much faster. So, taking that next step and getting to play against the best players in the world is what I’m most excited about. Will the fitness demands be more intense in the NBA? Yes and no. It’s obviously so important as a player to focus on training and our bodies, especially since there are more NBA games in a season than in the college season. But our training staff at IU was world-class and had very high expectations of us, so I feel like I’m prepared for anything that the NBA trainers will throw at me. I think I can handle the transition. Was it tough to keep your nutrition on point while on campus? Our coaching staff at Indiana definitely kept us in check when it came to eating healthy, and it was pretty easy for me because I’ve always preferred to eat healthy foods. I did just recently sign up for a meal plan that gets delivered to my house. All of the food is paleo, so it’s made it a lot easier to make sure I’m eating right and getting the proper nutrition. What has been the biggest lesson you learned from that ACL injury? To never take any minute you’re playing the game for granted because it can be taken away at any moment. You never know the next time you’ll be able to play, so always give your best effort when you do get to play. I’ve always been a hard worker, but rehabbing an injury like this takes a whole new level of commitment. I’ve really given it my all, and because of that I’m actually ahead of schedule. Rehabbing has made me a stronger person both physically and mentally, and I figure if I can overcome this, then I am ready for challenges I may face in the NBA. Regenerating is really important for me right now. I’ve gotten really into ice baths and I soak in one almost daily. It sounds crazy, but it really does help me relax. I also use stem machines and a foam roller for 20 minutes a day and get regular massages. Nothing too high tech, but it gets the job done. How does data and analytics shape your game and the way you play? At the beginning of my career, I never really looked at analytics. But, coaches and agents have showed me how it can help me grow my game by seeing statistically what my strengths are. It can be helpful, but I prefer to just go out there and play. How do you keep yourself mentally strong? For me it’s mostly just staying positive and not worrying about what other people are saying about me. It’s really easy to get wrapped into all of that: rankings, draft predictions, my weaknesses as a player—things like that—and you can end up worrying about things that you don’t have any control over. I remind myself that there are plenty of people going through more difficult stuff than me, and that I’m lucky to be where I am. So, I just tune out the negative stuff and focus on improving my game and being the best player that I can.